Scotland has an abundance of clean, well-oxygenated rivers, ideal habitat for fly fishing for Grayling. The Grayling Thymallus Thymallus is a Salmonidae and sometimes referred to in Scotland as the “Lady of the Stream”. These fish pack a punch and in the throughout the year are free rising to hatches, however, they are readily caught with nymphs and bugs close to the bottom. The River Tweed is closest to Edinburgh and holds prolific shoals of Grayling and some very big fish. Last year a client from the USA lost a fish at the net which I estimated to be close to 4lb. The British Record stands at 4lb 3oz. I know where to locate this fish so it’s just a matter of time! The River Annan is another prolific Grayling river, located about 1.5 hours south of Edinburgh. This offers a huge amount of grayling spots and there’s always the chance of connecting with some of the huge Brown Trout that this river holds. 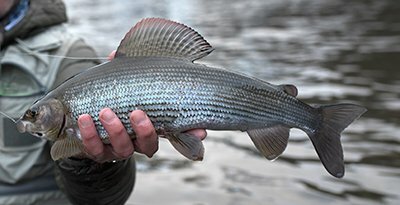 Finally, the River Tay should not be overlooked for Grayling. However, you really need to know the beats to fish and how and when to avoid the salmon anglers. We can help you plan the right trip. There’s always the bonus of having lunch in one of the fine salmon fishing huts on the River Tay too and sharing banter and stories with the salmon anglers. All of these rivers are accessible from Edinburgh. We also stock Tenkara rods, to allow you to fish this technique for the added thrill.